The Port of New Orleans reports it’s still business as normal despite flooding on the Mississippi. Over the weekend, Norwegian Spirit (shown at left) and Carnival Triumph successfully came up the river and turned around at the Erato Street Cruise Terminal without incident. The US Army Corps of Engineers has been able to maintain the water level at the Carrollton Gage in New Orleans just below 17 feet, and it believes they should be able to continue to do so. As long as the level remains at 18 feet or below, the port says they should be able to maintain normal operations. 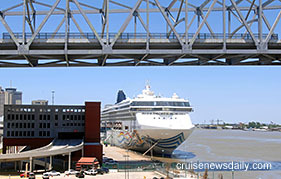 The port said today all operations at the Port of New Orleans continue as usual and are expected to continue normally. They said today cruise turnarounds this coming weekend (Carnival Triumph and Norwegian Spirit) are expected to operate as scheduled at the Erato Street Cruise Terminal. This week's news from the cruise industry, courtesy of Cruise News Daily, includes items about Celebrity Cruises advertising plans, Royal Caribbean ships not being for sale, a passenger alleging a musician aboard Navigator of the Seas assaulted her, changes to Norwegian Jade's winter program, Seabourn Quest, Celebrity Mercury being renamed TUI's Mein Schiff 2, changes to Norwegian Epic's entertainment, more problems with vendors at Falmouth Jamaica, and a new viral cruise video. MSC Opera is slowly headed to the Swedish port of Nynamshamn after it experienced a technical problem with an electrical panel late Saturday (May 14, 2011). It is expected to arrive there under tow Monday morning (May 16). The ship is without electrical power, which also means it is without propulsion. Passengers will be flown home from Stockholm on Monday. MSC says passengers will be given a credit voucher for the full amount of the trip. MSC Opera was on a 10-day Baltic cruise from Southampton, which also boarded passengers at Amsterdam. Technicians from STX, which built the ship, are working on the problem, so far without success. There is no word on when the ship will be able to return to service. MSC Opera has arrived at Nynamshamn. It arrived under tow at 11am local time Monday morning. They will be flown home from Stockholm today. During Sunday afternoon and evening, technicians were able to restart many of the electrical services, and during the evening, bars were open on a complimentary basis. Passengers were able to have a hot breakfast this morning. Passengers are being given a voucher for a full credit on a future cruise taken by December 2012. Additional technicians have boarded the ship and are working to repair the electrical problems and determine the cause of the original problem. As a precaution, the next cruise, which was to embark tomorrow (May 17), has been canceled, and passengers are being compensated. Lloyd Werft delivered the refurbished former Celebrity Mercury to TUI Cruises earlier this week, and Saturday (May 14, 2011) it was rechristened Mein Schiff 2 in Hamburg. This video shows the ship's "feel-good" (according to the line) christening (in German, but words aren't really necessary) by its godmother, Olympic fencing champion Anja Fichtel, hence the rather unusual method of releasing the bottle. TUI Cruises is a joint venture between the German travel conglomerate of the same name, and cruise giant Royal Caribbean Cruises Ltd.